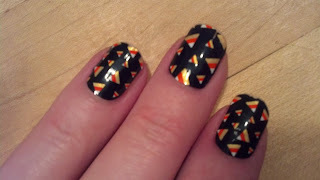 Sweetly B Squared: Finally Did My Nails! I used to L*O*V*E having my nails looking all pretty. I've spent time with acrylics and gels, but even when I haven't done that, I try to polish them regularly, so of course I've tried a few of the new nail products out there. They're pretty good, overall. The 'spots' are just my photography skills (or lack thereof). Although in all honesty I'm looking forward to peeling them off after tomorrow. See, the ends are sort of rough feeling. I keep waiting for one of them to snag on something, and a few times I've pulled fuzzies off of them. They're like stickers, but they don't feel completely 'stuck' around the tips. The most similar product I've used previously was Sally Hansen's stick on polish stuff (sorry - I don't have the exact name handy). I liked the results and the wear better from the Sally Hansen ones, but I think I was also making it a point to polish them every day too, so they didn't have much chance of wearing. But in some ways that makes the Avon ones better - I'm pretty sure I'll be able to peel them right off, where with the Sally Hansen ones I went through A LOT of nail polish remover trying to get the white background behind the design to go away completely. Either the Avon stickers or the Sally Hansen ones were superior to Jamberry nails, in my opinion. Jamberry's original nails came off within hours, even after following the directions exactly (Jamberry nails are actually applied using heat). I know they've changed they're formula or whatever, but I haven't wanted to invest to try them again, since I got my first set for free only to find they just didn't work with my nails. I asked to try the new ones, but a consultant only sent me one nail. That's nice, but I don't want to test the durability of having one nail not match the others for hopefully at least a couple weeks. I'd just feel self-conscious going around like that (although really I doubt most people would notice). I remember one year you had different nails every day for months!! I think I have too much oil in my system because they peel off right away.